Voltaire was a great admirer of the "English nation", and that admiration has been amply repaid by the attention of modern British scholars. In particular, it is at first sight surprising that the massive ongoing enterprise of publishing the new, definitive Complete Works is based not, as one might expect, in France but at the Voltaire Foundation in Oxford. The reason for English involvement doesn't really need much explanation - it is the legacy of one energetic and dominant personality, Theodore Besterman. An Englishman of Polish descent, Besterman was not an academic but had followed an extreme successful career as a writer, researcher and bibliographer. From the 1950s he devoted himself entirely to Voltaire studies, embarking upon the considerable project of editing Voltaire's letters. To a man of Besterman's mindset the only appropriate setting for such a labour was a residence of the great man himself. He set his sights on Les Délices, the house in Geneva where Voltaire had lived between 1754 and 1760. In 1929 the City of Geneva had been called upon to purchase Les Délices in order to safeguard the legacy of Voltaire but had yet to carry out extensive renovations or determine its final use. 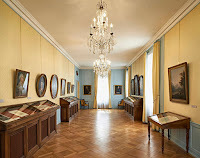 Besterman proposed to develop a research centre and museum; in return for funding for the necessary works, he agreed to place at the disposal of the municipality his collection of Voltaire-related paintings and works of art, together with his extensive archive of autograph letters and other manuscripts. The renovations took place between December 1951 and Autumn 1954.The first floor became two apartments with three bathrooms for Mr and Mrs Besterman, and the attic was arranged to accommodate a housekeeper and maid. 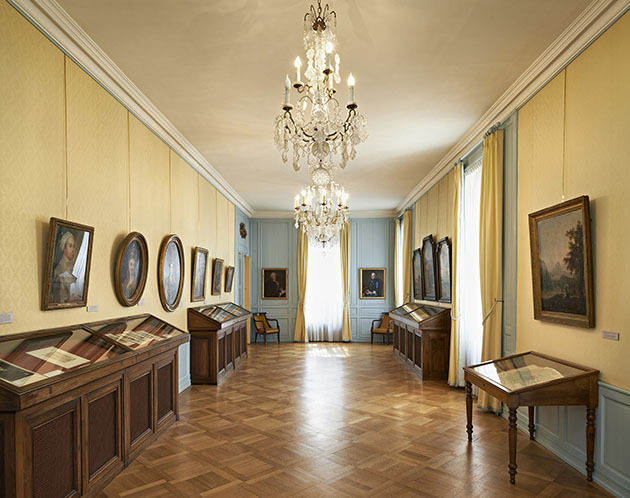 The new Institut et Musée Voltaire was solemnly inaugurated on 2nd October 1754. Over the next decade Besterman published prolifically: the two large volumes of Voltaire’s Notebooks appeared in 1952, the first volume of his magisterial edition of Voltaire’s correspondence in 1953 (it was107 volumes by 1965 when a second, ‘definitive’, edition was begun). He also edited the academic series Studies on Voltaire and the Eighteenth Century, started in 1955 and now running to over 500 volumes. His biography of Voltaire appeared in 1962. Besterman admitted his total identification with his subject: "For forty years I have been a Voltaire enthusiast, for twenty I have passed all my days in his company; for six I have lived in his house, slept in his room, in his library read his letters, opened his correspondance, explored his most intimate secrets; I have become, longo intervallo, almost Voltaire himself...."
The biography was admired for its scrupulous scholarship, though reviewers such as Peter Gay felt it lacked sufficient 18th-century context. Besterman's Voltaire was an urban freethinker; his approach contrasted with that of the leading French expert René Pomeau, whose La Religion de Voltaire (1953) had emphasised Voltaire;s serious engagement with the philosophical preoccupations of his time. As well as pursuing his own research, Besterman orchestrated a prodigious amount of activity from scholars around the world. 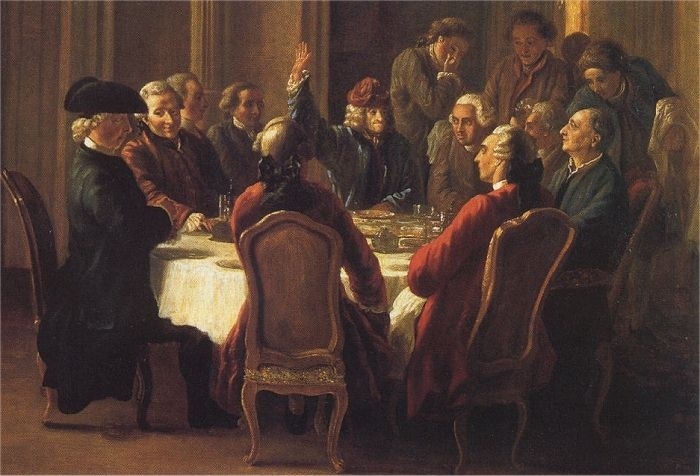 The International Society for Eighteenth-Century Studies - which today has its secretariat in Oxford at the Voltaire Foundation - .first met in the Château de Coppet outside Geneva in 1963: "It was memorable for the talks, the atmosphere, and the generous organisation including a dinner in the château at Chillon, ending with large sugar ‘cygnes du lac’ and a late-night private steamer back along the lake to Geneva" (Barber, 2010, p.4.) The Society continues to hold four-yearly conferences - though sadly not on so lavish an entertainment budget. There are thirty or so national affiliated societies. La Société Française d'étude du 18e siècle was founded in 1964 but, under the successive presidencies of Jean Guéhenno, Jean Fabre et Yvon Belaval, it was from the first firmly under the aegis of French academia. In 1971 Besterman came into serious conflict with the city of Geneva, when he attempted to raise funds by the sale at Sotheby's of materials which were considered part of the museum's assets. The Institut was closed down and a warrant issued for Besterman's arrest on the grounds that he was in possession of stolen papers. Fortunately for him he was attending the ISEC conference in Nancy at the time and, with the tacit collusion of the French government, managed to allude the Genevan authorities. He now settled permanently in England. Following Besterman's departure, the Institut et Musée Voltaire, now simply the Musée Voltaire, became part of the Bibliothèque de Genève. Its director for the next thirty years was the Rousseau scholar Charles Wirz (1973-2002) who is universally praised for his diplomatic and creative leadership. 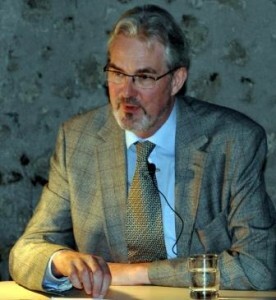 The present director is François Jacob, formerly a director of studies at the University of Franche-Comté. Between 1989 and 1994. Charles Wirz presided over the renovation of the property in preparation for the tricentenary celebrations. 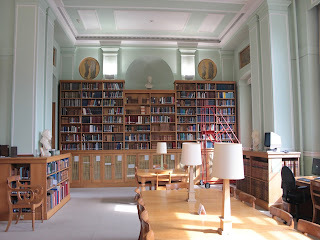 The library welcomes visiting scholars and the beautiful museum is open to the general public - well worth a visit! Returning to England, Besterman lived for a time in St James' but later moved to Northhamptonshire where he acquired the old manor of Thorpe Manderville, a late 18th-century ironstone house. Here he was within easy reach of London, of his printer in Banbury and of the facilities of the University of Oxford. On 10 November 1976, following Besterman's death, the Voltaire Foundation was created and vested permanently in the University of Oxford, which Besterman named as his residual legatee. Besterman's books and manuscripts were also transferred to a dedicated "Voltaire Room" in the Taylor Institution (Modern Languages Faculty library). The core mission of the new Foundation was to be the publication of a new Complete Works of Voltaire. Andrew Brown, Besterman's former secretary, became its first director. There was at first some doubt as to the scholarly standing of the Foundation's publishing enterprise. According to Haydn Mason, "concerns were allayed" by René Pomeau's agreement to edit the critical edition of Candide for the Complete Works. (It appeared in 1980). In the 1980s and 90s the Foundation produced not only the works of Voltaire but new editions of other Enlightenment thinkers, notably the correspondence of Rousseau. It also published the four-volume biography Voltaire et son temps, a monumental project directed by René Pomeau. 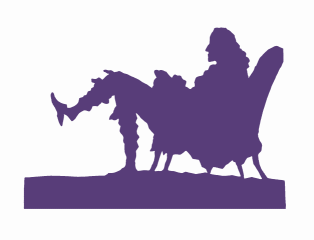 The Foundation's monograph series Studies on Voltaire and the Eighteenth century (now Oxford University Studies in the Enlightenment) currently runs to over 160 volumes. In 1998 the Foundation was rocked by a scandal which Voltaire himself would have relished, when its long-time director Andrew Brown was forced to resign under a cloud. What exactly happened has not been made public. There were hints of financial mismanagement. According to the official statement Mr Brown face disciplinary charges "relating to the competence of his management of staff" . He first agreed to take "special leave" then in 1998 resigned altogether. His wife Ulla Thulying who was in charge of editing the Complete Works also departed. In response to Mr Brown's new society, in June 2000 the Voltaire Foundation set up the Société des Études Voltairiennes (SEV) with a virtually identical mission:"to promote, encourage and co-ordinate all studies, research and publications relative to Voltaire". Slightly farcically, both organisations claimed the inspiration of René Pomeau who, shortly before his death in 2000, suggested that a dedicated Voltaire organisation should be set up on French soil. The SEV had stronger ties with French academia: it is based at the Sorbonne, and has close links with the University of Lyon which hosts its website: its Revue Voltaire is published by the Presses Universitaires de la Sorbonne (PUPS). Confusion reigned for a while but, fifteen years on, some sort of modus vivendi has been established between the rival societies and publications. In an interview in 2015 Andrew Brown, who was riding high after his involvement in the discovery of Madame du Châtelet's scientific manuscripts, defended the need for two Voltaire associations; he has buried the hatchet with the Sorbonne, though not yet, it may be inferred, with his former colleagues in Oxford. At the beginning of the new century the Foundation was reported to be in severe financial difficulties and was desperately casting around for sponsorship. The new director Nicholas Cronk improved matters by undertaking to finish the Complete Works by 2018 (which means a smart publication schedule of six volumes per year) The Foundation has also moved into e-publication as part of the "Electronic Enlightenment" project which was launched in 2008. I suspect, however, that the long term future remains uncertain. One problem is that the Foundation's publications, the Electronic Enlightenment included, remain eye-wateringly expensive and beyond the reach of all but the largest university libraries; "ordinary" dix-huitièmistes are lucky to see more than a Google Books snippet. I do wonder if at least some of this scholarship be made available at a more modest price? I am sure Voltaire (if not Theodore Besterman) would approve. Clare Fletcher, "Besterman’s commitment to the Eighteenth Century is still alive" Voltaire Foundation blog, post dated 4th February 2014. Interview with Andrew Brown, 21/08/2014 Gazette des Délices 42 Summer 2014. .
Vincent Noce, "'Etat acquiert le château de Voltaire. Ferney a été vendu par Christie's pour 17 millions de francs" Libération, 6 June 1998 .